China Shuts Down Tens Of Thousands Of Factories In Unprecedented Pollution Crackdown : Parallels After decades of doing little about the pollution that has plagued much of the country, China's government is temporarily shutting down entire industrial regions to inspect for violations. A woman wearing a face mask walks on a street as Beijing is hit by polluted air and sandstorms on May 4. In the gritty industrial town of Yiwu, workers prepare jeans to be dyed in a vivid range of colors. Two months ago, this factory — and this entire city, located in China's eastern province of Zhejiang — was a much quieter place. Inspection crews from the environmental bureau had shut businesses down, cutting electricity and gas so that they could determine who was following China's environmental laws and who wasn't. The boss of this factory, who asked that his name not be used for fear of punishment by local officials, says he's never seen anything like it. "It had a big impact on our business," he says. "We couldn't make the delivery date since we [were] shut down. It's not just our factory. All the factories out here had this issue." This is happening across the country: Entire industrial regions of China are being temporarily shut down, and the unusual sight of blue skies is reappearing as environmental inspectors go about their work. 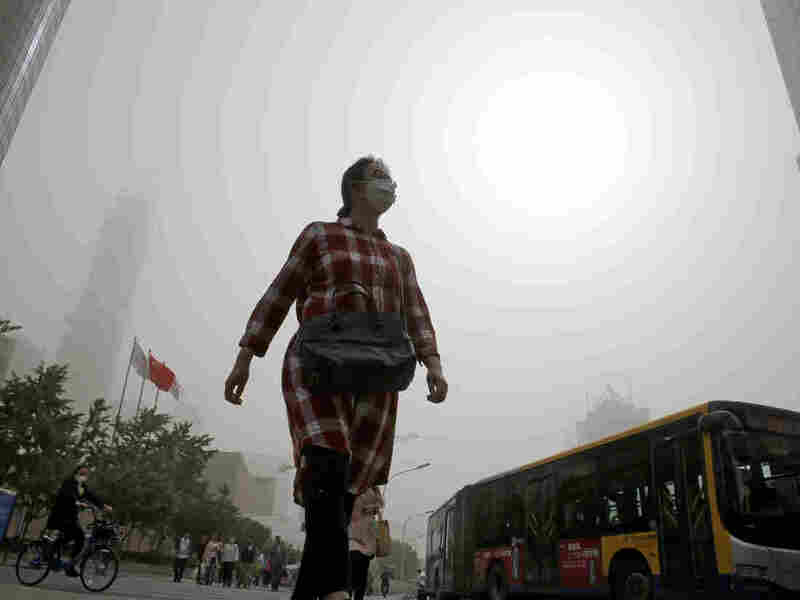 After decades of doing little about the pollution that has plagued much of the country, China's government may be finally getting serious about enforcing its environmental laws. "So, basically, you're seeing these inspectors go into factories for surprise inspections," says Gary Huang, founder of 80/20 Sourcing, which connects foreign clients with China's supply chain. "They're instituting daily fines, and sometimes — in the real severe cases — criminal enforcement. People are getting put in jail." In the past year, China's Ministry of Environment has sent inspectors to 30 provinces, where they've reprimanded, fined, or charged officials in more than 80,000 factories with criminal offenses. Entire swaths of Eastern China have halted production, prompting some companies to move entire supply chains to countries like India and Bangladesh to meet their orders. "It's a huge event. It's a serious event. I think many of us here believe it will become the new normal," says Michael Crotty, president of MKT & Associates, a company that exports textiles from China. Crotty says in his nearly two decades in China, he's never seen a crackdown of this magnitude. "The consumers of China don't want red and blue rivers. They don't want to see gray skies every day." China's crackdown reminds Crotty of 1970s America after the Clean Water Act was passed. "At that time, we in the textile business saw many dyeing and printing houses shut down because they couldn't comply with the regulations. We're seeing a similar process taking place here in China, and it's much, much bigger. The disruption is larger," he says. Crotty's colleague Archie Liu, general manager of MKT & Associates, estimates that 40 percent of China's factories have been at least temporarily shut down in the latest spate of inspections. He says that's a good thing. "After all, factories will be better, more sustainable, and more socially responsible after being inspected," he says. "It's better for our supply chain. Then we can tell Walmart, Costco, and other retailers of ours that we're qualified and that everything we make for Americans are environmentally friendly." After a quarter century of living in China, Shanghai environmental lawyer Peter Corne is gleefully celebrating the new environmental crackdown. "This is better than a 100-percent pay raise for me," says Corne, managing partner at Dorsey & Whitney's Shanghai office. "I was just dreaming about it. I never thought it would come true." Corne says what's most promising about this new enforcement are the new fees that are being imposed when factories, whose emissions are now monitored in real time, discharge more than the law allows. "The implementation will be totally different," Corne says. "It won't be the environmental bureau that's implementing anymore. They'll just be monitoring. It will be the tax bureau that's implementing it." This is crucial, says Corne, because China's tax bureaus are powerful entities backed up by rigorous laws that, when violated, are typically met with aggressive local enforcement. Corne's confident the economic hit will be temporary as companies that specialize in clean tech get a boost from so many factories now being forced to comply with much stricter laws. But in the short term, that's little consolation for businessmen like Michael Crotty. "So, short-term, the disruptions are pretty significant, and the timing, quite frankly, is difficult," Crotty says. Difficult, because these shutdowns have impacted supply chains producing goods for the upcoming Christmas season in the U.S. Crotty thinks Americans will see an increase in prices on the shelves this holiday season due to the breadth of China's factory shutdowns. But, he says, it's a small price to pay for a cleaner China. Yuhan Xu contributed research to this story. An earlier Web version of this story incorrectly said China's environmental authorities had sent inspectors to 10 provinces. They were sent to 30 provinces.